Finally, besides the basic commonly used MR sequences for brain imaging already discussed, under certain clinical situations other different parameters are employed that are tailored to the site of anatomical interest or intrinsic properties of the area imaged. 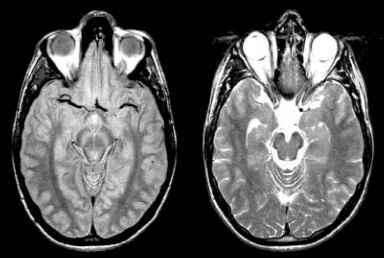 Examples include imaging of the internal auditory canal, cranial nerves, leptomeninges, and pituitary gland: thin sections (3 mm) in various orthogonal planes and various contrast agents are used (Figs. 71-74). Occasionally when one is attempting to locate a small pituitary microadenoma or for bringing out early enhancing areas within a tumor to facilitate a better biopsy or resection, dynamic imaging can be applied with fast imaging to monitor contrast delivery to these areas of interest. For seizures, 3D volume coronal spoiled GRASS (SPGR) and FLAIR sequences are added to the basic protocol for better detection of small temporal tumors or mesial temporal sclerosis (Fig. 75). Fig. 68. 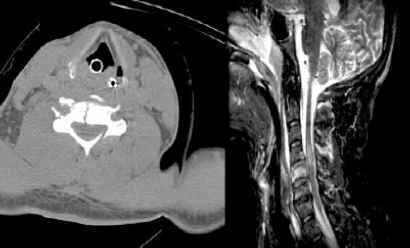 Hemosiderosis with a thin line of dark "etching" along the brainstem owing to chronic hemorrhage from a distal spinal ependymoma that bled. Fig. 69. 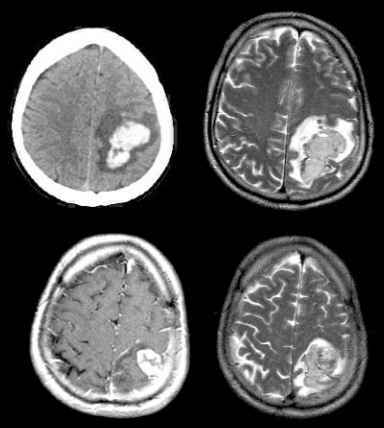 Axial noncontrast computed tomography (top left), T2 (right), and postcon-trast (bottom left) T1 MR images demonstrate a hemorrhagic renal metastasis with inhomogeneous signal (with blood fluid level top right) that does not follow the concentric temporal evolution pattern of simple hematoma. Fig. 70. 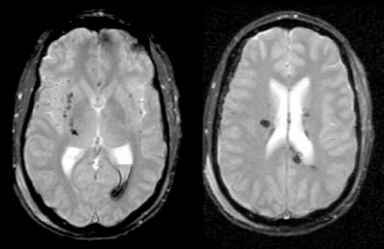 Axial gradient-echo/susceptibility images of subarachnoid and intraventric-ular bleed. Fig. 71. 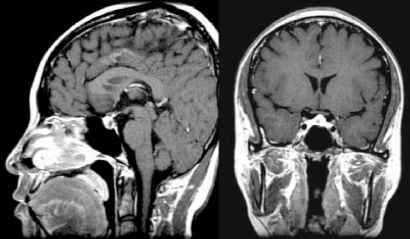 Coronal (left) and axial (right) thin-section (3-mm) postcontrast images showing an enhancing right intracanalicular acoustic schwannoma. For spinal imaging, STIR sequences are currently often used in the setting of trauma for detecting subtle fractures and ligamentous injuries (Figs. 76 and 77). Phase-array capability also allows imaging of the entire spine in a short period to access abnormalities in all (epi- and intradural and intramedullary) spinal compartments (Figs. 78-80). In addition, both MRA and diffusion techniques can be utilized for the diagnosis of spinal arterial venous malformations and spinal cord infarcts, although within certain limitations (Figs. 81 and 82). Fig. 72. 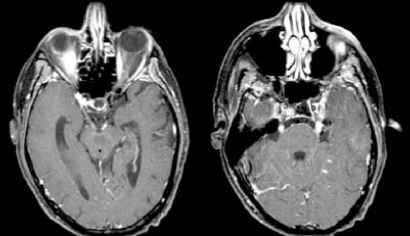 Axial postcontrast T1 images illustrating bilateral enhancement of cranial nerves III (left) and V (right) in a patient with lymphoma. Fig. 73. Diffuse leptomeningeal enhancement on computed tomography (top left), sagittal (top right), and axial (bottom) T1 MR images in a breast cancer patient. Fig. 74. Sagittal (left) and coronal (right) thin-section (3-mm) images through the pituitary gland illustrating delayed enhancement of a right microadenoma. Fig. 75. 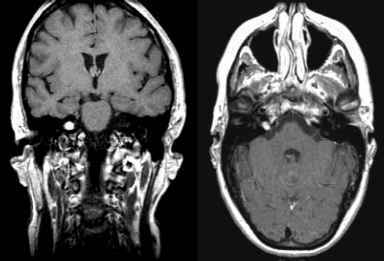 Coronal FLAIR MR images of mesial temporal sclerosis with an enlarged left temporal horn (left) and increased signal of the left hippocampus (right). Fig. 76. 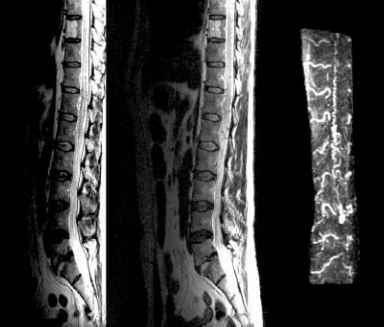 Computed tomography (left) and sagittal STIR (right) images of the cervical spine showing a subtle C6 vertebral body and spinous process fractures with marked increased signal of the paraspinal soft tissue and interspinous ligaments (C2-C6). Fig. 77. 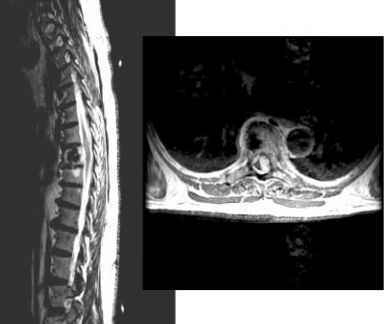 Axial computed tomography (left) and sagittal STIR (right) MR images revealing fractures of C5 and C6 vertebral bodies with increased marrow signal consistent with edema and loss of normal dark linear integrity of the posterior longitudinal ligament and abnormal cord signal all consistent with traumatic injury. Fig. 78. 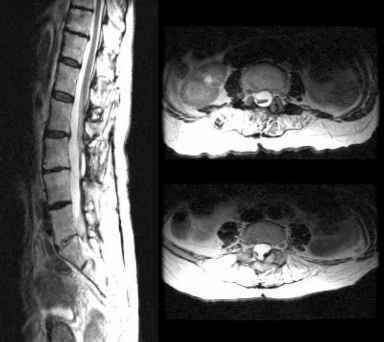 Sagittal T2 (left) and axial postcontrast (right) MR images show bony metastasis to mid thoracic spine with enhancing epidural component causing cord compression. Fig. 79. 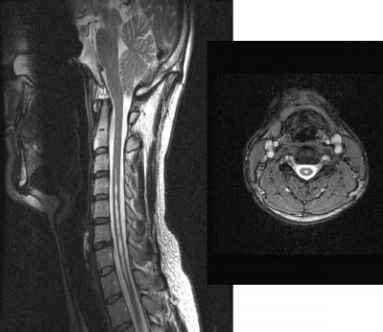 Sagittal (left) and axial T2 (right) MR images in a patient with arachnoiditis seen here with clumping of the nerve roots and an almost "empty sac" appearance (bottom right). Fig. 80. 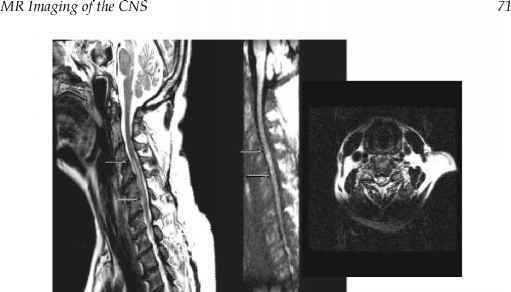 Sagittal (left) and axial T2 (right) images show an elongated increased intra-medullary signal lesion that follows the CSF on all pulse sequences, consistent with cervical thoracic syringohydromyelia. Fig. 81. 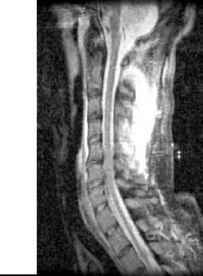 Sagittal T2 (left, middle) and TOF (right) MRA of the spine depicting abnormal intramedullary T2 signal of the distal cord with multiple serpiginous flow voids and corresponding flow signal on MRA consistent with a spinal arteriovenous malformation. Fig. 82. Sagittal T2 (left), diffusion (middle), and axial (right) T2 images of the cervical spine show abnormal increased signal at C4 and C5 representing cord infarction. 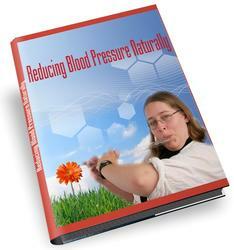 especially in functional MR, spectroscopy, and perfusion applications. 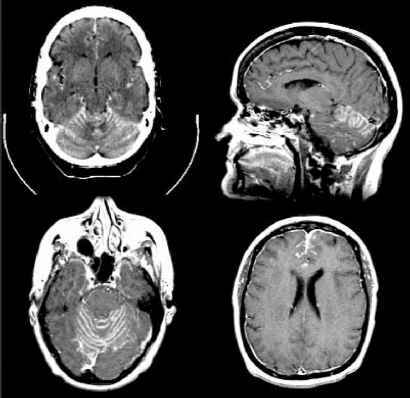 The latter is reflected in the ability of high-field MR scanners to image a slice of tissue in 3-4 ms; in other words, the entire brain can be imaged in 1 s compared with approx 10 slices/s in a 1.5-T magnet. 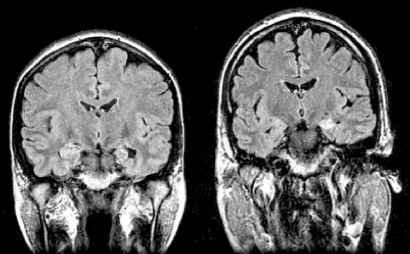 Other advantages of high-field imaging include an increase in SNR and the fact that it allows the use of a lower dose of contrast agent to achieve the same effect. 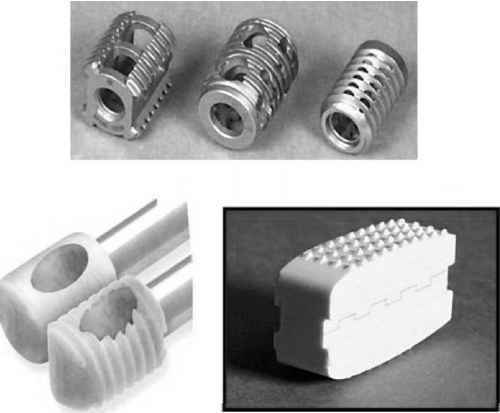 On the other hand, the main drawbacks of high-field magnets are the increased sensitivity to susceptibility effects, especially at the bone/air/soft tissue interface and the higher energy deposition to body tissues.